Have you given up on your New Year’s resolution yet? I’m not one to mock someone’s attempt at self improvement, but resolutions made for the new year that are abandoned by the end of January is almost a cliche. I tend to start new things when I start them throughout the year; if I started them in January, they could be considered New Year’s resolutions, but since I start them in March or September, they’re just goals. Maybe I stick with some, maybe I stop with others. There is something about the new year, though, that makes people want to take stock. Perhaps it’s the turning of the calendar, or the thought of time passing, that makes us take stock of the past and look towards the future. Like the odometer flipping from 99,999 to 100,000, a micro-moment that makes us realize that time waits for no one. It was in this frame of mind, several weeks ago, that Darren Rowse from Problogger (and many other things) released a short episode talking about an alternative New Year’s resolution. I was wondering if a much better starting point for thinking about our goals for our blogs and businesses might be if we set New Year’s resolutions for our readers. Pretty bold of me, I know. To set goals for you, the person who happens to be reading this right now. How can I set goals for you? 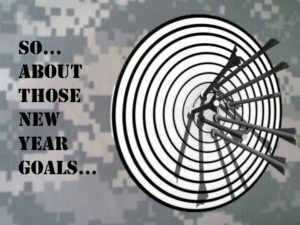 Who am I to say what you should or should not do this year, to meet or not meet a goal? But I’m going to go ahead and do it anyway, and leave it up to you as to whether or not you want to join in. No harm if you don’t, nothing bad’s going to happen. As I’ve written elsewhere, I have three specific types of readers. First, the veterans themselves who read my blog. Maybe they’re doing well, maybe they’re not. Maybe they’re doing well, and then all of a sudden stop doing so well, or would like to do better. Second, the veteran’s family. I define a veteran’s family however they define their family; spouse, children, parents, grandparents, girlfriend/boyfriend, lover, cousin, best friend, anyone who knows a veteran personally and loves them as family. They’re experiencing the veteran’s life right alongside, the good, the bad, everything. And finally, those in the veteran’s community who are not veterans themselves. Those who want to help veterans with more than just a “thank you for your service” or who want to understand veterans on another level. For my brothers and sisters in arms. Doesn’t matter to me what branch of service, or even what nationality. The impact of combat and military service knows no boundaries or nationality, rank, branch, or period of service. My goal for you this year is for you to become more aware of your own limits and capabilities when it comes to mental health. It’s not something that makes you weak, if you reach out for therapy, it’s a sign of strength and can make you stronger. In order for me to measure this achievable goal, I’m setting a goal of at least one veteran a month reaching out to me with a question, a comment, a thought that something I’ve written has changed their perspective. Want to help me achieve this goal? Send this to a veteran you know. Start a conversation. For the family members and those close to veterans. My goal for you this year is for you to gain another level of understanding about what your veteran experienced in the military and what they may be going through regarding mental health. 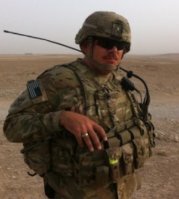 To have those who have questions or concerns be able to reach out in the same way that veterans are going to in the first goal, to ask a question of me that they may not think they can ask of their veteran. A big step towards this particular goal is a partnership that I’m starting in February of 2017, as a blogger for the Military Spouse Advocacy Network. I’d love to have at least one conversation a month with a family member of a veteran, to support both them and their veteran. Finally, for those in the veteran’s community. Service providers, employers, those who may not know many veterans personally or have any in your family. The fact that you’re reading is great, it means you want to learn and understand more. My goal for you is to bridge the gap in understanding between veterans and those who have never served. To take the time to engage with the veterans you work with, or employ, to access resources that allow you to support veterans in a meaningful way. I’ll facilitate bridging this gap in any way that I possibly can: directly, if you’d like to reach out, but also indirectly by providing you a glimpse into the mindset of a veteran. So there you have it. A goal for each of you. If I missed a typical reader, then I’m not aware of you: reach out and let me know! And if you are one of these three typical readers, then I’d love to hear from you as well. Comment below or send me a message…I’m not that hard to find…and let’s have a conversation. Thanks for the feedback, Sean! THAT’S what I want to facilitate…the ability to help others meet their goals in order to lead a more rich and fulfilling life. I appreciate the support!